Detractors are not getting their job done and it is quite plain for all to see. Your overall leadership goal for this box is to quickly get them out of this box through rapid improvement, redeployment, or removal. Leaders’ time and energy, their “leadership capital,” is scarce and they have to invest it intelligently across all their employees. In the short term (2-3 months), you are going to increase your leadership capital investment in this box to make that move happen. 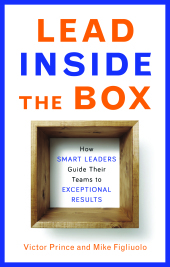 This short-term investment pays off in the long term because you will reduce your time spent leading in this box. 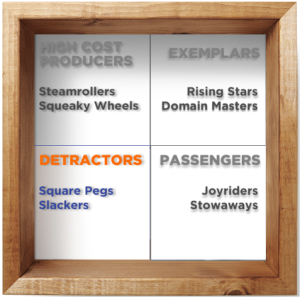 Type 1 – “The Square Pegs” – Square Pegs are the 10 percent of your team that consume 90 percent of your leadership capital. They claim to work hard and long and make sure everyone knows it but don’t get their jobs done despite that. You have to double-check on everything they do. Their work is often late, incomplete and sometimes flat-out wrong. You are still dealing with some of their past messes. The rest of the team tries to avoid working with them. You have come to realize they don’t have the skills needed for the job they are in. Leadership Strategy – “Fill Skill Gaps” – Your goal is to get this person out of the Square Peg box in the short term, either by having them rapidly improve or by redeploying them to another job better suited to their skill set. Type 2 – “The Slackers” – The Slackers have all the required skills on paper and they did great in their job interviews for the role. However, since they got their jobs, their talents have not translated into the results you expected. They appear to be content knowing how to do the job instead of actually doing it. They seem to think that you are paying them for being smart instead of for being productive. You frequently have to push them and check on their progress in completing work. Your “check ins” with them often feel like debates. They can talk the talk in meetings, which they think will make up for their failure to walk the walk outside of meetings. Leadership Strategy – “Unlock Motivation” – These are your potential high risk, high return leadership investments. Your goal is to get the people you hired to perform at the high levels of which they are capable. All that is holding them back is their motivation, so if you can figure out how to motivate them, you could receive a quick and possibly large return on that leadership investment.